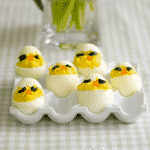 Your holiday table would not be complete without these adorably festive Easter Chick Deviled Eggs. 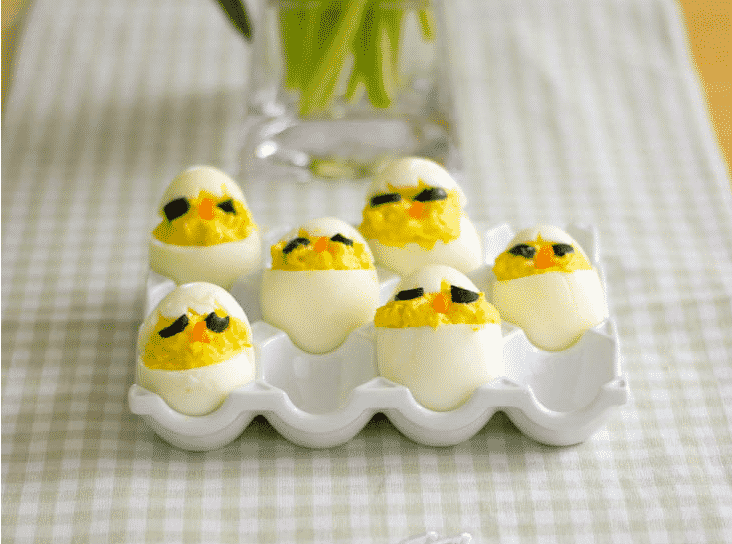 I know, Easter has come and gone but I made these adorable little “chicks” with my deviled eggs and had to share them with you. For many, you’ve probably seen them before, but if not, aren’t they the cutest little things ever?! They are so adorable that you could probably make them any time of year and they would elicit the same Oooh’s and Aaah’s. Here is my recipe for Deviled Eggs. Simple right? I don’t like a lot of other ingredients in my deviled eggs. I also make my egg salad the same way; though I add some celery for a little crunch too. To prevent cracking, remove eggs from refrigeration about 30 minutes prior to boiling. Place eggs in a saucepan and cover with cold water. Bring to a boil then let simmer for approximately 6 minutes. Eggs will be done if you can spin them on their vertical axis. If they fall to the side, they’re not done. Remove from water and place in an ice bath (water and ice) several times until they have cooled. You can also make these hours ahead and refrigerate. 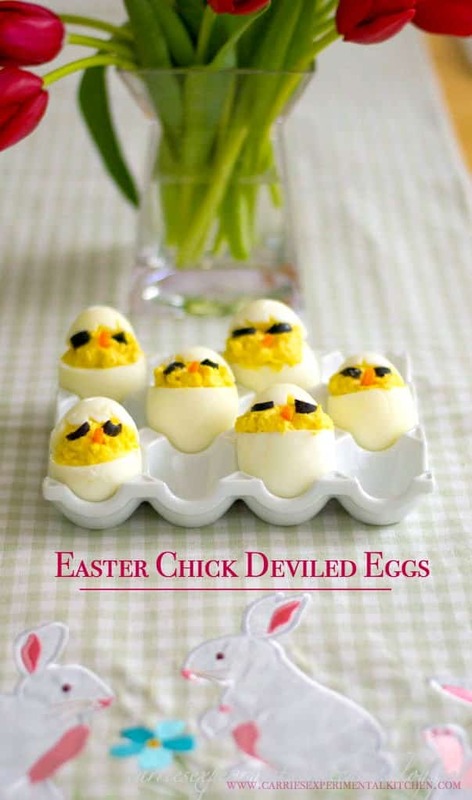 These Easter Chick Deviled Eggs are a big hit every year at my home. I hope they are at yours too. ~Enjoy! To prevent cracking, remove eggs from refrigeration about 30 minutes prior to boiling. Place eggs in a saucepan and cover with cold water. Bring to a boil then let simmer for approximately 6 minutes. Eggs will be done if you can spin them on their vertical axis. (If they fall to the side, they're not done). Remove from water and place in an ice bath (water and ice) several times until they have cooled (you can also make hours ahead and refrigerate). Peel the eggs and rinse off any remaining shells. Cut the top 1/4 off of the egg and gently scoop out the yolk using a small knife or spoon. Add the yolk to a bowl, mash with a fork and place egg white on a serving platter. (if using a flat platter, cut a small piece off of the bottom of the egg so that it sits flat). Add mayonnaise and mustard to the egg yolks and mix well. Carefully fill the bottom portion of the egg white with the yolk filling. Next, place the white "cap" on top of the egg yolks. Cut the black olive into 12 pieces and place 2 pieces for the eyes. Cut the carrot into 12 small pieces and put a piece on the egg filling for the nose. Refrigerate until ready to serve. This one is very cute! very creative!